Doping Agency Says 11 Teammates Testified Against Lance Armstrong : The Two-Way The United States Anti-Doping Agency released more than 200 pages of documents in its case against the cyclist. 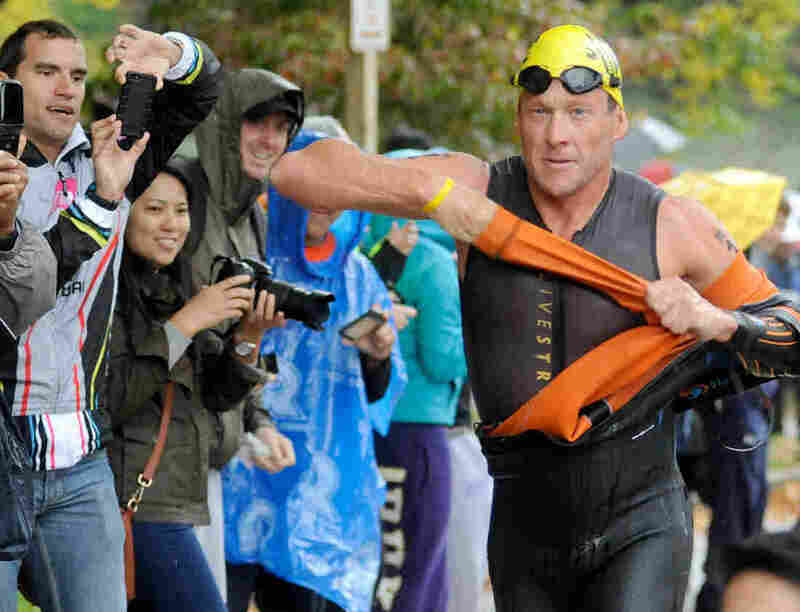 Lance Armstrong competes in the Rev3 Half Full Triathalon Sunday in Ellicott City, Md. Armstrong joined other cancer survivors in the event, which raised funds for the Ulman Cancer Fund for Young Adults. The United States Anti-Doping Agency has made public all the evidence it has against cyclist Lance Armstrong. This is the culmination of a battle that has raged for years: The USADA has said its evidence proves beyond doubt that the now-dethroned seven-time Tour de France winner doped, and Armstrong has always maintained his innocence. -- USADA says the evidence shows the US Postal Service team ran "the most sophisticated, professionalized and successful doping program that sport has ever seen." In the report it says that Armstrong not only doped himself, but he required his teammates to adhere to the same kind of doping program. -- 11 former teammates of Lance Armstrong admitted to doping. -- George Hincapie, whom Armstrong has referred to as a "brother," issued a statement admitting to doping and signaling that he testified against Armstrong. The report details his allegations. -- Armstrong's attorney Tim Herman called the USADA's case a "one-sided hatchet job." According to a press release previewing the more than 200 pages of documents, USADA CEO Travis T. Tygart says 11 of Armstrong's former teammates testified that Armstrong had doped. "The evidence shows beyond any doubt that the US Postal Service Pro Cycling Team ran the most sophisticated, professionalized and successful doping program that sport has ever seen," Tygart says. "The evidence also includes direct documentary evidence including financial payments, emails, scientific data and laboratory test results that further prove the use, possession and distribution of performance enhancing drugs by Lance Armstrong and confirm the disappointing truth about the deceptive activities of the USPS Team, a team that received tens of millions of American taxpayer dollars in funding. "Together these different categories of eyewitness, documentary, first-hand, scientific, direct and circumstantial evidence reveal conclusive and undeniable proof that brings to the light of day for the first time this systemic, sustained and highly professionalized team-run doping conspiracy. All of the material will be made available later this afternoon on the USADA website at www.usada.org." Armstrong has always maintained his innocence but in August decided he would not fight the charges brought against him by the USADA. Because of that, the USADA stripped him of his seven Tour de France titles. The organization is now sending all its evidence to the Union Cycliste Internationale, which can chose to appeal the USADA's decision. "The evidence demonstrates that the 'Code of Silence' of performance enhancing drug use in the sport of cycling has been shattered, but there is more to do," Tygart said. "From day one, we always hoped this investigation would bring to a close this troubling chapter in cycling's history and we hope the sport will use this tragedy to prevent it from ever happening again." There's no word yet when all the documents will go online. We'll update this post with more as it becomes available. The report from the USADA is structured chronologically, so there is no easy way to read just one teammate's affidavit. That said, the chronological set-up makes for interesting reading. We've skimmed a good deal of the report now, and what's clear is that the USADA provides a good deal of first-hand testimony of teammates who saw Armstrong take banned substances and were introduced to Dr. Michele Ferrari, the Italian physician portrayed as a doping genius, by Armstrong. There is no testimony more important that that of George Hincapie, who is widely considered to be Armstrong's lieutenant on all seven of his Tour de France wins. In his book Every Second Counts, Armstrong calls Hincape "true-blue, like a brother to me." In Hincapie's case, he said he got on Ferrari's plan in 2000. According to the report, Hincapie asked Armstrong to introduce him to the physician. That Ferrari would put him on a doping schedule was implied and expected. "According to Hincapie, at the training camp there was a discussion about blood doping and 'Dr. Ferrari said that it improved performance.' Hincapie continued the discussion about blood doping with Johan Bruyneel and Pepe Marti. Hiring Dr. Ferrari was part of the blood doping program. Hincapie agreed to hire Ferrari and was told that it would cost him $15,000 for the season. Hincapie testified that, 'Dr. Ferrari told me that the team doctors would assist me with the blood doping program and they did.' Hincapie would continue working with Dr. Ferrari until 2006, and would participate in the U.S. Postal Service blood doping program from 2001 through 2005. Hincapie had a conversation with Armstrong in 2001 about Hincapie beginning on the blood doping program. From his conversations with Armstrong and experiences with him Hincapie was aware that Armstrong used blood transfusions from 2001 through 2005." In other parts of the report, Hincapie is quoted as saying that he witnessed Armstrong use testosteron patches and on one occasion, he used his apartment as the location for a blood transfusion. Hincapie told investigators that shortly before the 2005 Tour de France, "I was in need of EPO and I asked Lance Armstrong if he could provide some EPO for me. Lance said that he could, and he gave me two vials of EPO while we were both in Nice, France." "The evidence is overwhelming that Lance Armstrong did not just use performance enhancing drugs, he supplied them to his teammates. He did not merely go alone to Dr. Michele Ferrari for doping advice, he expected that others would follow. It was not enough that his teammates give maximum effort on the bike, he also required that they adhere to the doping program outlined for them or be replaced. He was not just a part of the doping culture on his team, he enforced and re-enforced it. Armstrong's use of drugs was extensive, and the doping program on his team, designed in large part to benefit Armstrong, was massive and pervasive." Via The Race Radio, here is the full 200-page "reasoned decision" by the United States Anti-Doping Agency. As we told you, it is now up to the Union Cycliste Internationale if it wants to appeal the decision. In a statement sent to USA Today, Armstrong's attorney attacked the Tygart press release. "Tygart's statement confirms the alleged 'reasoned decision' from USADA will be a one-sided hatchet job — a taxpayer-funded tabloid piece rehashing old, disproved, unreliable allegations based largely on axe-grinders, serial perjurers, coerced testimony, sweetheart deals and threat -induced stories," Herman said. Phillip Hersh of The Chicago Tribune and Los Angeles Times reports on Twitter that the USADA will not release 1,000 pages, instead it will be about 200 pages as previously expected. Matt Slater of the BBC says the USADA is holding back about 800 pages because some of the USPS team members are appealing. George Hincapie, who has long been reported to have testified against Armstrong, has made it official today with a statement on his website. "Early in my professional career, it became clear to me that, given the widespread use of performance enhancing drugs by cyclists at the top of the profession, it was not possible to compete at the highest level without them," Hincapie said. "I deeply regret that choice and sincerely apologize to my family, teammates and fans." Hincapie does not mention Armstrong by name, but he said that he cooperated with federal authorities and the USADA. "I would have been much more comfortable talking only about myself, but understood that I was obligated to tell the truth about everything I knew," he said. "So that is what I did." This is important because in the past Armstrong has described Hincapie as a "brother to me." According to CBS News, Hincapie told federal officials that "he and Armstrong supplied each other with the endurance-boosting substance EPO and discussed having used another banned substance, testosterone, to prepare for races." "Frankie Andreu, Michael Barry, Tom Danielson, Tyler Hamilton, George Hincapie, Floyd Landis, Levi Leipheimer, Stephen Swart, Christian Vande Velde, Jonathan Vaughters and David Zabriskie."